Looking for a Reliable Whitestone Plumber? Most of us must have experienced plumbing problems in our home at some point. If these things do happen, we usually call a professional Whitestone plumber to do the fixing if we don't know how to do it ourselves. In times when there is no available help right away, you need to know some basic plumbing emergency tips to mitigate the problem. While the easiest solution is to keep Bluewater Plumbing, Heating, and Air Conditioning's number handy, there are some things you can do to lessen the damage depending on your plumbing problem, while you wait for your plumber to arrive. 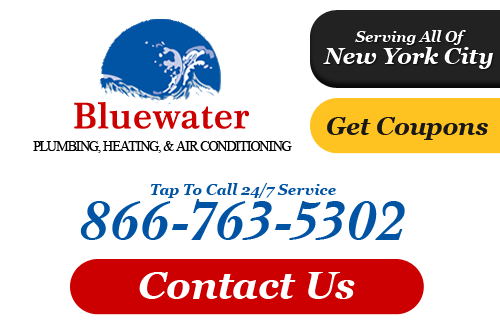 When it comes to fixing plumbing problems, it really should be left to professional plumbers in Whitestone, NY. Changing broken faucets, unclogging sinks, or repairing leaking pipes...if it is not properly fixed, you will suffer the same problem over and over again. So don't leave it up to chance - call the professional plumber you can count on for quality plumbing repairs in Whitestone, NY everytime: Bluewater Plumbing, Heating, and Air Conditioning! If you are looking for a professional Whitestone plumber or heating contractor then please call 866-763-5302 or complete our online request form.